Maine Lobstermen Give Farming Sea Scallops A Try As more areas are becoming overfished, fishermen and scientists in Maine are developing a way to farm scallops instead of catching them. It's said to be safer for the environment and brings in more money, but the method isn't approved yet. As lobster prices plunge, scallops offer fishermen an alternative to make money. If you don't love scallops, you probably just haven't had one that's cooked properly. That is, pan fried with some garlic and butter and herbs. They are very tasty. In Maine, scientists and fishermen are learning how to farm, instead of catching, these tasty sea critters. That could be good for business and the environment. Out on the water off Stonington, Maine, Marsden Brewer is motoring his lobster boat through the crowded fishing harbor. Today, just about all the boats here are lobster boats. But 30 years ago, he says, it was a different story. "You see all the boats and stuff? Come Nov. 1, most of them would all be rigged up for scalloping. There was that many scallops in [close to] shore here," Brewer says. "Now there's maybe four boats that go." Brewer would like to see more of these boats return to scalloping — this time by farming scallops. That could make better business and environmental sense. In some places, sea scallops are still plentiful. But in others their numbers have been reduced. Farming scallops would take pressure off the natural stocks. Fisherman Marsden Brewer (left) and researcher Dana Morse are still refining their techniques for sea scallop farming. Outside the harbor, Brewer motors over to one of his green and orange lobster buoys. He grabs the buoy and uses the winch on his lobster boat to haul up an experiment — two big wire mesh cages that he's farming sea scallops in. On board, Brewer has a scientist who's helping with this aquaculture testing. Dana Morse is with the Maine Sea Grant program and University of Maine Cooperative Extension, which works with farmers and fishermen. "Oh, I'm psyched here. We stocked them a couple of weeks ago and so this is my first look since," Morse says. Pretty soon, out of the clear cold Maine water, the scallop farming cages rise up from the bottom 50 feet below, and the two men lift them onto the deck of the boat. The crates are filled with thousands of small baby scallops. The cages are about 4 feet wide and several feet high. Inside, stacks of mesh-lined trays hold and protect the scallops, which are each a little smaller than a dime at this stage. Scallops are not like mussels that just sit stuck to a rock. These little guys squeeze water out of their shells to propel them away from starfish or other predators. That's why you have to farm them in cages; otherwise, they'd swim away. They also have rows of deep blue eyes in between their shells. "Little sea scallops — they're beautiful little beasts. Particularly when they're young, you get all these zigzag, modeled stripy colors in there," Morse says. The scallops fetch a nice price at the dock, too. 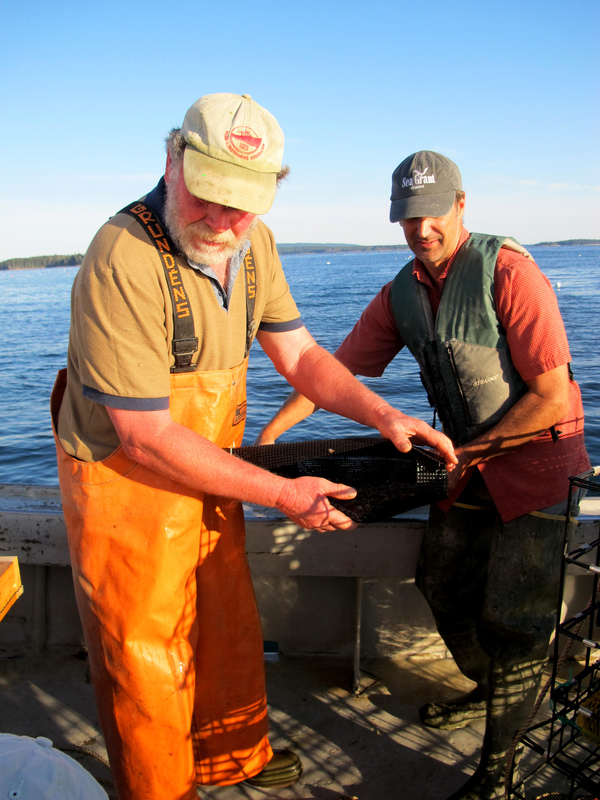 Lately, the price of lobster has plummeted and that's hurting fishermen like Brewer. So this is another way to make money. Instead of just pulling up lobster traps, one day they could be pulling up crates full of farmed scallops. "Just the future for the community is what it amounts to. You know, I've been involved in most all the fisheries over the course of my life, and this is — lobsters — about the only one left," Brewer says. People have tried to farm sea scallops in the U.S. before but researcher Morse says it hasn't worked very well. A big problem is that the little larval scallops take a long time to grow and don't do well in a hatchery. But a few years ago, Morse went with a delegation to Japan. It turns out the Japanese have the real secret to farming sea scallops. "For people thinking about either restocking natural populations or doing aquaculture, the question is how do you get your seed? 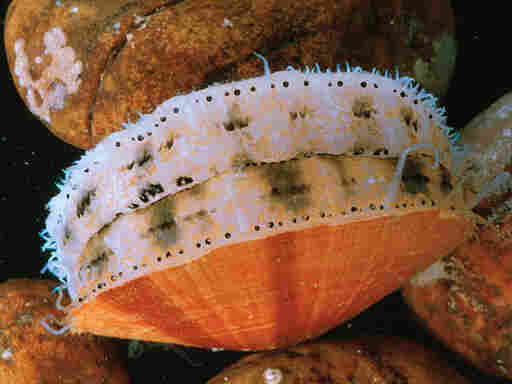 And the Japanese technique turned out to be very applicable to the species of scallop that we have here: Placopecten magellanicus," Morse says. It's very low-tech. Catching tiny baby scallops out in the ocean can be done with wadded-up netting — sort of like a bunch of onion bags from the supermarket. If you suspend the netting in the ocean in the right spot, thousands of baby scallops will float in naturally and start growing there before getting transferred to bigger cages. Morse and Brewer toss their scallop cages back into the water before they get too warm. Up here, by the way, they're pronounced "scallups"-- not "skal-ups." Aquaculture experiments like this are not without their occasional mishaps. Brewer's wife, Donna, has come along to help record the size of the scallops, and there's also a radio reporter stumbling around. With so many people on board, somebody kicks a water pipe off the bottom of a big lobster tank and sea water starts pouring into the boat. But probably the biggest potential snafu in this farming effort will be getting regulatory approval. 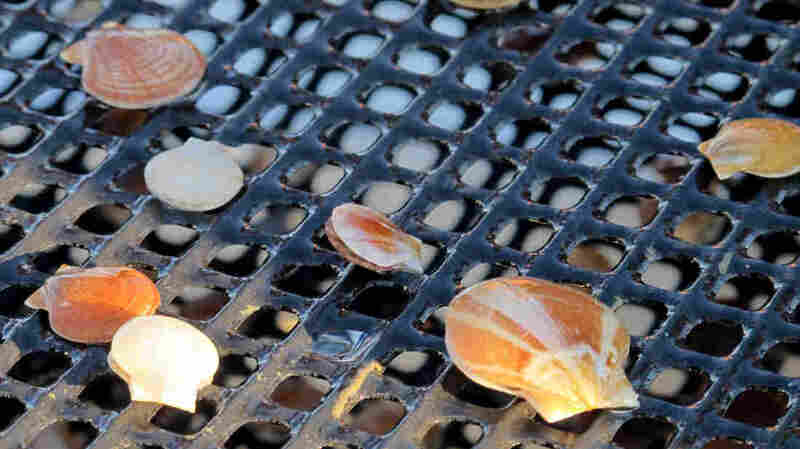 Morse and Brewer think they have the technique coming together pretty well, but before anyone can farm scallops commercially, state and federal authorities will have to give it the OK and come up with a set of regulations. A previous Web version of this story, as does the audio, said that scallops have been overfished in many places. While that is true in areas closer to shore, where numbers remain well below historical levels, in offshore fishing grounds such as Georges Bank, regulations begun in the late 1990s have helped rebuild a healthy scallop fishery.